In February, Charlotte Douglas International Airport (CLT) began requiring workers to carry their personal items in clear bags when passing through security checkpoints on their way to work. The new policy began just as the House Homeland Security Committee released a report titled America's Airports: The Threat from Within, which highlighted a lack of employee screening and vetting at U.S. airports. CLT's policy, among the first in the nation, applies to approximately 9,000 airline workers, concession and aviation department employees at the North Carolina airport, which served more than 44 million passengers last year. McCarran International in Las Vegas has a similar program in place. Officials at CLT say they enacted the policy to be proactive about the security threats identified in the report that came out at approximately the same time. The Congressional report mentions general examples of gun and drug smuggling, an attempted bomb detonation, willingness to smuggle in explosives, and links to terrorist activities overseas-all by employees at U.S. airports. Specific incidents cited include three employees at Minneapolis-St. Paul International Airport who were recruited to fight for ISIS; a Delta Air Lines employee who smuggled firearms on flights between Hartsfield-Jackson Atlanta International Airport and Kennedy International Airport in New York; and a Federal Aviation Administration inspector who was carrying a firearm in his baggage at LaGuardia International. While CLT hasn't experienced any incidents of this magnitude, it is trying to make sure that it never does. "The push for this was born out of the insider threat challenge that we have seen as an industry," says Jack Christine, CLT's chief operating officer. "We wanted to make sure we were doing everything we could to ensure the folks who travel through our airport, as well as the folks who work here, are as safe as possible. Clear bags are recommended by the TSA as a best practice. We see it as a move toward a positive, comprehensive approach to employee security." Christine considers CLT's clear bag policy a good stepping stone toward 100% employee screening-something he predicts many airports, including CLT, will find difficult to achieve if it eventually becomes a federal requirement. "The clear bag policy is a good proactive step to help alleviate some concern about employees not being 100% screened, because now, as they walk through the building, anyone can see what they are carrying," he explains. It is part of a multi-layered approach and is a positive step as far as maintaining a secure posture from the employee side." Airport Spokesperson Lee Davis explains that CLT began working on the new policy in 2016 to help tighten security in secured and sterile areas, while also balancing the need for employees to carry personal items. The policy, which took effect Feb. 1, does not cover all 20,000 people who work at the airport. Unaffected employees include workers moving baggage and other items in non-sterile areas, airline flight crews entering through the Known Crew Member portal, badged employees who arrive on flights prior to their shifts at CLT, airline mechanics in uniform traveling for official business, law enforcement officers on official duty, employees transporting required medical devices, credentialed Transportation Security Inspectors, and limited one-time entries approved in advance by the airport security coordinator. "The clear bag policy took us awhile to complete because we were very deliberate about it," says Christine. "We worked very closely with our partners in the TSA, concessionaires and the airlines, because that is who it was going to impact the most." He describes Initial response from airport partners as understanding, but not overly enthusiastic. Change management was consequently among the first steps taken to implement the clear bag policy. CLT officials were very deliberate and had multiple conversations with stakeholders and affected employees, notes Christine. The airport also mounted a marketing campaign at employee entrances. Posters detailing the new policy explained why and when it would take effect. "We gave them as much information as we could about the when, why and how," he recalls. "We also purchased the first round of bags for everyone." 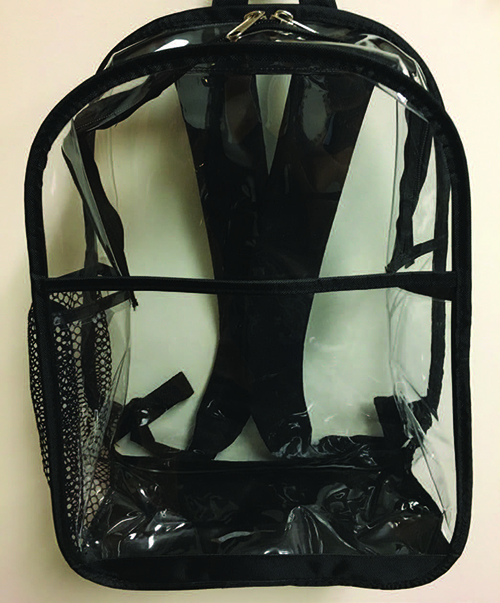 The airport distributed clear backpack-style bags with mesh water bottle holders to every affected employee in mid-January. If the bags are lost, stolen or damaged, employees are required to replace the bags with acceptable clear bags of their own. Employees hired since the program launch are required to purchase their own bags-not to exceed 37 inches (length, width and height). "Providing the bags to existing employees made it a little easier for folks to digest the change, because they didn't have to spend money to buy the bag," Christine explains. "Also, when they need to replace it, there is really no question about what the bag is supposed to look like." The airport eased employees into the change with a "soft start" during the first month. Personnel stationed at entry points reminded employees not carrying their personal items in clear bags that they had until March 1 to do so. "This is when we implemented the actual policy and started citing folks if they didn't have their bags," says Christine. The citations did not carry a monetary penalty for the first two weeks, but fines were in play thereafter. "By taking a very deliberate approach to how we rolled out the policy, we minimized the consternation that employees had. We really didn't hear a lot of negative feedback," he reports. "There were a handful of employees who had the need for special circumstances, and we worked through those things with them." By design, the policy is very explicit: "Any employee accessing the Secure Area from the Public or Sterile Area MUST have a clear bag. 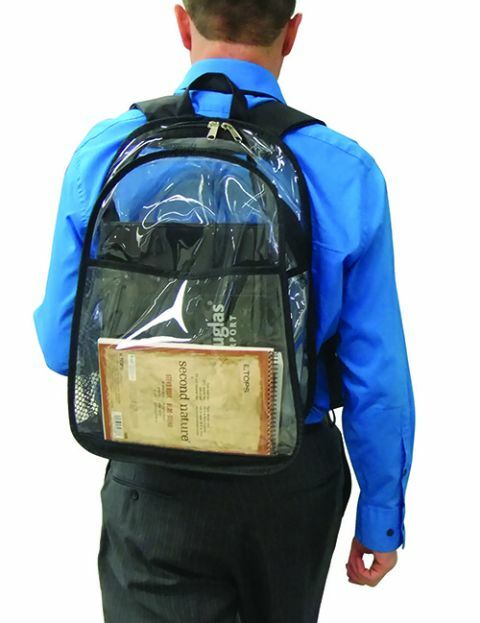 Opaque (nonclear) bags will not be allowed, with the exception of the insulated lunch bag." Plastic or paper lunch bags are not allowed. The policy further specifies that employees' clear personal bags cannot exceed 37 inches (length, width and height), and insulated lunch bags cannot exceed 32 inches (length, width and height). Clear roller bags are allowed if they meet all size requirements. The policy then spells out procedures for infractions: "Those who do not comply will be denied access and will be required to return their unauthorized bags to their vehicle." The policy also reminds employees that everything they carry must fit into their bag. Employees bringing medication or other personal care items must place them in a small cosmetic bag or privacy bag within the clear bag. Wallets, purses and handbags also must go into the bag. Per the airport's written policy, such smaller items are still subject to inspection. Ideally, the goal is to have no opaque items in the clear bag so inspections take seconds instead of minutes. "Of course, prohibited and illegal items are still prohibited in the bags," notes the policy. Employees who need certain tools to do their jobs can carry them in the clear bag if they fit, or they can pass through the employee checkpoint in the lobby for additional screening, notes Christine. "We recognize we can't impede folks from doing their jobs," he says. "There are employees, who from a maintenance perspective, need to carry certain tools with them to do their jobs. We recognized that on the front end, and have accommodated that within the policy." The airport also frequently conducts random bag inspections with the help of TSA, security staff and the local police. Airport officials continue to meet regularly with TSA to adjust this and other policies that are part of CLT's overall security program. "We are always looking at the things we do, and trying to make them better because the threat continues to evolve," says Christine. "We have a strong relationship with the TSA, and our police service, and we all work together to make the airport as safe as we can possibly make it." On any given day, CLT's clear bag policy affects 7,000 to 8,000 workers. With several months under their belts, employees seem to have adapted to the change. "We don't hear any real complaints, and we write a minimal number of citations," reports Christine. "Most employees have just started following the policy and have adapted to it very well. Those airports considering a clear bag policy need to know that once they get through implementation, it just becomes the new normal."